Whoever has their name on the most pieces of paper, wins. This has been true in the print world since the beginning of print. The more copies available, the more exposure people have to those books. The more exposure, the more potential fans. With authors, having big print runs is always a good thing. Even if a hardcover run doesn't sell that well, the books get remaindered. While authors don't get any royalties on these $3.99 discount titles found in the sales sections of bookstores, these books do find new readers, some of who will go on to buy the author's other, newer work. If your book stays in print, and it's joined by other books of yours, this improves your chances to be discovered, because now you have shelf space. If your books take up five, ten, or twenty spots on a bookstore (or library) shelf, you're more likely to be noticed by browsers. But your name on books isn't the only paper that counts. Your name in reviews leads people to your books. Your name on the blurbs of other writers' books can also have a similar effect. Every short story you write and sell widens your potential fanbase. Ads. Press releases. Articles. Every piece of paper your name is on can help your career, because it's one more reminder to the world that you exist. It's a paper trail that leads right to you. But does this apply to virtual paper? How about ebooks and the Internet? The Internet is permanent. Every mention of your name and your books will last forever, leading people in your direction. And unlike print, which can take a long time to build up to reach that critical mass/tipping point where you become a household name, the Internet can work much faster. As far as I know, no author has gone "viral" yet. Though some, like Cory Doctorow, Boyd Morrison, and Scott Sigler, have used the Internet wisely to widen their fanbase and turn popularity into money. This blog gets thousands of hit per week. 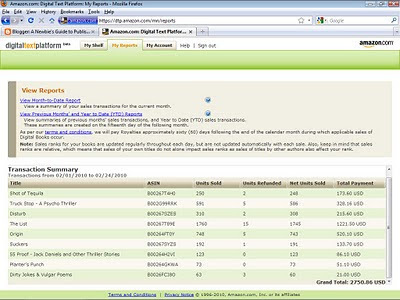 On weeks I blog about ebooks, my ebook sales go up. When I release a newsletter to 10,000 people, my Amazon numbers spike. If I Twitter something timely, I get more traffic. Your digital name on digital paper (the world wide web) works twice. First, it works for those who see it when it happens. Next, it works for those who see it weeks, months, or years after it happened. It can be both instant and cumulative. And it can be very effective. As of today, Feb 24 at 9:07am, I've made $2750 this month on Kindle. I'd be a fool not to. More ebooks means more chances to discover me, which means more potential sales. The more shelf space I have, the more books I'll sell. Which brings us to the obvious question: What can you do to get your name on more pieces of paper? 1. Look At Your Past - My early novels, which were rejected more than 500 times, have become long-term investments that are finally paying off. I wish I had more rejected novels. If you've got a book that was good enough to land an agent, but didn't sell, there's no reason you shouldn't be getting some of this ebook traffic. Just make sure the work is good. 2. Previously Published Work - Got some out-of-print novels? Some short stories or articles? 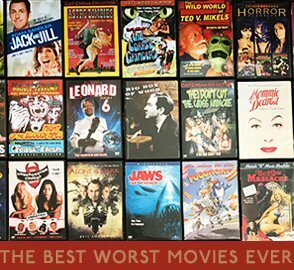 Turn these into ebooks. Put them on your website for free, and on Kindle for a small fee. The more virtual shelf space you take up, the better. 4. Reviews - Recently, several large NY Print Publishers announced they were discontinuing printed galleys and instead giving ebook advanced readers to booksellers and reviewers. Guess what? I've been doing this for years. I've sent out hundreds of ebooks for free to reviewers and bloggers and booksellers. If you can trade an advance ebook copy for a review, that's a small price to pay. 5. Writing. Writers write. If you're avoiding writing for the ebook market, you should perhaps rethink your priorities. 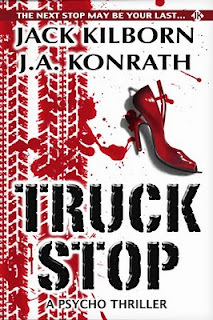 My third bestselling ebook on Kindle is TRUCK STOP. I wrote TRUCK STOP specifically for Kindle. And I had an insidious reason for doing so. TRUCK STOP is a Jack Daniels novella, where Jack chases two killers. The first is Donaldson, the villain from SERIAL which I wrote with Blake Crouch under the name Jack Kilborn (and which has been downloaded more than 200,000 times.) The second is Taylor, the villain from AFRAID by Jack Kilborn. TRUCK STOP is basically a gateway drug. Those who read SERIAL for free, or TRUCK STOP for $1.59, will often go on to read AFRAID and the entire Jack Daniels series. TRUCK STOP is a fun story, with some thrills and laughs, but its ultimate goal is to lead people to more of my writing. It's currently the #380 bestseller in the Kindle store. AFRAID is currently #756 in the Kindle store. It came out ten months ago, and is priced at $5.59. WHISKEY SOUR is currently #3174 in the Kindle store, priced at $4.79. That's not too shabby, considering it came out six years ago. Why is a six-year-old book selling better than 420,000 other Kindle titles, many by big bestselling name authors? Because of shelf space and paper trails. Because I've positioned myself there, with low cost Kindle books and timely blog topics. Because I've blurbed a lot of authors, and keep my website updated, and use Twitter and Facebook. Because I've toured, and been reviewed, and gone to conferences, and generally done all that I can to get my name out there. I never got big discounting in the bookstores, or coop. I never got huge marketing campaigns. I never got big print runs, or my books in Sam's Club and CVS. Yet I'm still standing. And I can't help but think it has something to do with my efforts to get my name on as many pieces of paper--both dead tree and virtual--as I possibly can. Quality counts. But quantity is important too. It would be wonderful if every new book got a huge print run and a major advertising campaign and a giant marketing push. I'm still waiting for that to happen to me. But while I continue to wait, I'm doing everything I can to make my own luck. And as the tide shifts from DTBs to ebooks, more and more authors are going to make their own luck, too.